Port Corpus Christi continues to secure its role as the Energy Port of the America’s. Roots in the petrochemical industries run deep. Natural gas is very important to the industries investing billions of dollars around the South Texas port. Port Corpus Christi is the top wind energy port in the nation. Including wind turbine components, project cargoes related to other energy sectors are frequently handled at Port Corpus Christi docks. Port Corpus Christi has a number of projects setup within a $1 billion capital investment plan. A major item already underway is the deepening of the Corpus Christi Ship Channel from 45 to 52 feet. 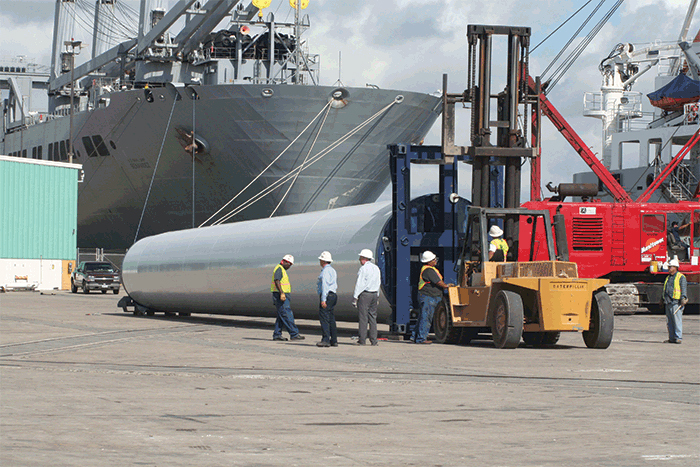 A wind turbine section being moved at Port Corpus Christi Cargo Dock 8 on the Inner Harbor.